Here's an idea for fellow organists with portable gear-getting gigs with the organ accompanying Christmas sing alongs! I told the group that if they got tired of the organ I would turn around and switch to the piano. Nobody asked me to switch. I used a variety of more liturgical sounds-bright for songs like 'Deck The Halls' and less strident sounds for 'Holy Night'. One person in the group commented on my sound selection for each song and understood the appropriateness of the sound. 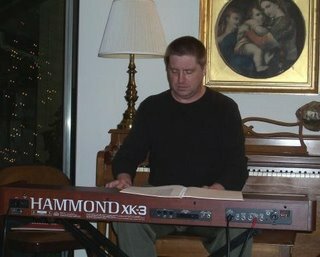 I mainly used long connected chords, not too much ornamentation, it's about the music, not the musician! Red Young is playing tonight in Austin at the Elephant Room along with Brannen Temple and who knows who else, but it should be incredible. Red Young has been on and continues to tour with Eric Burdon of The Animals.